EDMONTON - Pre-race favourite Peter Sagan made a little bit of history Tuesday night when he became the first man to wear the yellow jersey in the inaugural stage of the Tour of Alberta cycling race. The Cannondale team rider took a commanding 13-second lead over his nearest competitor in the opening 7.3-kilometre time trial. Victoria's Ryder Hesjedal sits in 10th, 30 seconds back of Sagan. "I was trying to do well here," said Sagan, a 23-year-old Slovak rider. "It's the first stage and it's important. I felt very very good." Sagan, not normally known as a time triallist, completed the stage in eight minutes 28.1 seconds. Sagan said he was surprised by the hundreds of people who lined the route and crowded the downtown Edmonton square where the race begins. "In Alberta, I am here for the first time and I am surprised at how many people were watching," said Sagan. "It was very good." Hesjedal echoed Sagan's praise for the race. "As I hoped, it was phenomenal. We're very used to big-time bike racing all over the world, and it felt just like it always does here," said Hesjedal. "The fans were incredible, the course was incredible. It was a pleasure." BMC Racing's Cadel Evans, the 2011 Tour de France champion and another rider considered to have a chance at the first-ever Tour of Alberta podium, also finished in the top 10, about 20 seconds back of Sagan. Hesjedal's Garmin-Sharp teammate Rohan Dennis, 23, came in second at 8:41:65. The prologue was laid out over a twisty, up-and-down loop linking Edmonton's downtown, the provincial legislature and the city's leafy river valley neighbourhoods. Margins are expected to be tight and battles for time bonuses will be crucial. 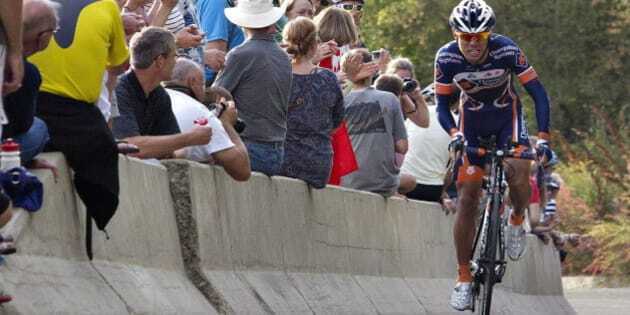 With the race's lone mountain stage cancelled due to road damage from floods early in the summer, there will be no epic climbing stages to string out the peloton and separate contenders. Most stages are expected to end in bunch sprints, in which all riders in the first group to cross the finish receive the same time. "I'll try and hold the yellow jersey, but I am still preparing for Quebec-Montreal," said Sagan, referring to races in Quebec scheduled immediately after the Alberta event. "We will see during the race what I can do." Because they're battling only against the clock, Tuesday's time trial was one of the choice spots in the race for riders to squeeze out a few precious seconds on their rivals. Hesjedal said that Sagan's healthy early-race lead is going to make it tough for anyone else looking to wear yellow. "Most people in the race knew that if he rode the way can he's very capable of winning this race and already he's putting into people," said the Canadian. "It definitely makes it difficult." The course favours sprinters like Sagan, Hesjedal said. "But we all know things can change of the road and anything can happen." On Wednesday, the race moves north along Edmonton's refinery row, then loops back south through rolling parkland. The 159-kilometre stage ends in Camrose. The Tour of Alberta then cycles through prairies, badlands and foothills before ending up in downtown Calgary on Friday for a total 900 kilometres of racing. The Tour is the largest and most highly-ranked bike race ever held in Canada. It involves six top-ranked teams from the European Pro Tour and eight teams from the Continental tour, as well as the Canadian national team. Its 117 riders include 11 winners of single stages or one-day events, five current national champions, two world champions and two major European tour winners, including Hesjedal, winner of the 2012 Giro d'Italia.